The army staged a coup in Ouagadougou, the capital of Burkina Faso, on Thursday after mass protests on Tuesday against plans by the land-locked West African country’s president, Blaise Compaoré, to change the constitution so he could continue for another term in office. Compaoré had seized power in a military coup on October 15, 1987, during which the Castroite President Thomas Sankara was murdered. Compaoré has enjoyed the support of Paris and Washington. Under his presidency, Burkina Faso has worked closely to support French military interventions in Ivory Coast in 2011 and the ongoing war in Mali. He has served as Burkina Faso’s head of state for 27 years, including two seven-year terms as president and then two five-year terms, the second of which is drawing to a close. On Thursday, apparently with the connivance of the army, hundreds of demonstrators invaded and sacked the parliament where, that day, deputies were due to vote the extension of Campaoré’s eligibility for the presidency. The crowd went on to take over the main TV and radio building. After the toppling of Compaoré, who has fled to the French-installed regime of Alassane Ouattara in Ivory Coast, a brief power struggle ensued within the army. On Saturday, it designated as interim president a close confidante of Compaoré, Colonel Isaac Yacouba Zida, the second in command of the presidential guard. Meeting at 1 p.m. during Saturday calm, the official pro-imperialist opposition, known as the “Leader of the Opposition”, an umbrella for several parties and civic groups, having met with the French ambassador on Thursday, called for a rally on Sunday morning in order to head off the mass rejection of military rule and claim its own participation in the coup. This is in line with the position of the French government, which has called for “calm” in Burkina Faso. Yesterday night, the army stormed the Place de la Nation, blockaded the square, and took national television off the air. They also held closed-door meetings with the opposition leaders. 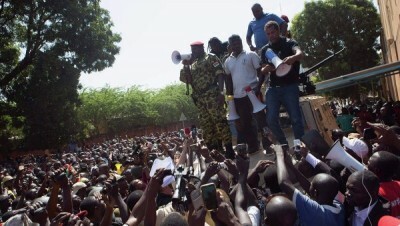 The army and the bourgeois opposition are both seeking to crush mass anger against Burkina Faso’s discredited neo-colonialist regime, working closely with the imperialist powers. This is the latest in a series of protests against Compaoré’s rule and the high cost of living that were brutally repressed in 2007, and again in 2011, during the revolutionary upsurge of the working class in Egypt and Tunisia. The former French possession, with a population of 17 million, is one of the poorest countries in the world. It was colonized by France in 1896 and hosts a French military base for operations across the region. The “Leader of the Opposition” spokesman Zéphirin Diabré is a sitting deputy and current Minister of Trade and Industry. He worked as CEO of the Africa and Middle East division of French energy multinational Areva from 2006 to 2011, the post he left in order to “become a consultant in the sphere of financing of mining”. He has been chairman of the UPC (Union for Progress and Change) party since 2012. Imperialism’s nervousness at a possible “African Spring” and fear of popular revolts against its client regimes is expressed by a letter sent to Compaoré by Hollande, dated October 7, published by Jeune Afrique on October 30, pleading with him not to try to cling to power and thereby provoke a revolt which would destabilise the region and France’s capacity to maintain control of its resources, notably the uranium mined by the French company Areva in the Sahel.